Syrian army units and paramilitary forces are reportedly moving into Raqqa province, seizing strategically important areas along the Salamiyah-Raqqa road which leads directly into the Islamic State stronghold. On Sunday, Syrian government forces and Palestinian armed militia captured the strategically important Tal Masbah hilltop, the last entrenched Islamic State (IS, previously ISIS/ISIL) position. The fortified position guarded approaches to the Salamiyah-Raqqa highway, leading to the terror group’s stronghold in the city of Raqqa, Al-Masdar news outlet reported, citing a military source. Later that day, the Syrian government army launched a massive assault on the village of Zakiyah and seized an important crossroads near the village, cutting IS’s major supply route from Raqqa to nearby Hama province. 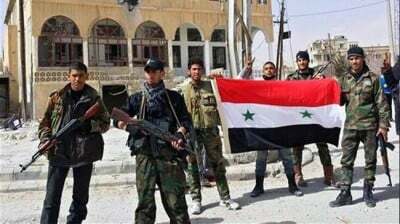 The Syrian government army’s 555th Brigade, 4th Mechanized Division, “Desert Hawks” brigade and Golani regiment, as well as the pro-government Palestinian Liwaa Al-Quds militia (Jerusalem brigade) took part in both ground offensives. A source in the 555th brigade told Al-Masdar that IS militants entrenched at Tal Masbah hilltop were forced to flee northeast towards the desert on the Raqqa-Hama border, where an intense battle between the terror group and government forces is taking place. The Syrian government army is also set to retake the key Tabaqah military airbase in southwest Raqqa province, which was captured by IS in August 2014. The advance into IS-held Raqqa province would allow Damascus to regain control over a region where Syrian government forces have had no presence since 2014. It would also complicate any move by Saudi Arabia to deploy forces to the area. Previous media reports indicate that Saudi Arabia is considering a full-scale ground invasion into war-torn Syria, where they are backing anti-government rebels battling Syrian President Bashar Assad. Riyadh has also been threatening that Assad will be toppled if he does not leave during a period of political transition. “Bashar al-Assad will leave – have no doubt about it. He will either leave by a political process or he will be removed by force,” Saudi Arabian Foreign Minister Adel al-Jubeir told CNN. The possible Saudi intervention as well as recent Turkish artillery shelling of Kurdish and Syrian army positions came amid a successful anti-IS offensive by government forces in Aleppo, another important region.